In November 2015 in a safari park in southeast Russia, the zookeepers threw a goat in the pen of a Siberian tiger for the tiger to hunt and eat. But the goat showed no fear of the big cat. In fact, he chased him out of his enclosure and took over his bed. The tiger, unbothered, moved to the roof. He did not consider the goat his prey. The zoo employees were stunned. Nothing like this had happened before. 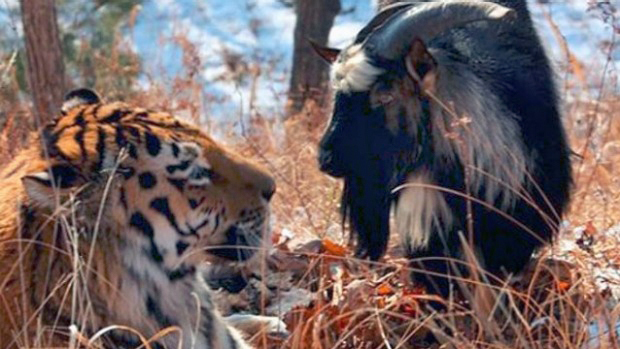 Within days the goat, named Timur, and the tiger, named Amur, became close friends. Now the tiger and goat romp about in the pen. One snatches a ball from the other and runs away, while his pal tries to catch up. They sleep next to each other in the sunshine. Thousands of fascinated visitors have braved the Siberian cold and come to the park to watch the odd couple. The zoo staff has set up a webcam to broadcast live to the internet. They also switched the tiger’s diet from goats to rabbits. At the time of this writing two months have passed. Zoologists around the world are baffled by the phenomenon and everyone wonders when, or if, the tiger will return to his goat-eating self. According to the park director, the goat seems to consider the tiger his leader and follows him everywhere. When I heard of this unnatural situation, I thought about a prophecy found in the Old Testament in the book of Isaiah. It’s about a new heaven and a new earth brought about by the return of the Messiah (Jesus) to Earth. Although the word tiger is not used, the prediction is strikingly close to the friendship between Amur and Timur. Is Amur and Timur’s playfulness just a freak of nature? Is it unnatural or supernatural? Could they be God’s sign pointing us to Isaiah’s prophecy? Then I saw a new heaven and a new earth, for the first heaven and the first earth had passed away and there was no longer any sea. I saw the Holy City, the new Jerusalem, coming down out of heaven from God, prepared as a bride beautifully dressed for her husband, And I heard a loud voice from the throne saying, “Now the dwelling of God is with men, and he will live with them. They will be his people, and God himself will be with them and be their God. He will wipe every tear from their eyes. There will be no more death or mourning or crying or pain, for the old order of things has passed away. Did you catch that? There is a new world coming. And in that world there will be no predator or prey. Death, fear, and pain will be no more. People and animals will once again be friends, just as they were in the beginning. …God has given us eternal life, and this life is in his Son. He who has the Son has life; he who does not have the Son of God does not have life. Read 991 times	| Like this? Tweet it to your followers!